Researchers at the Massachusetts Institute of Technology have created the first battery-powered robot that can run up to 10 mph, jump over a 16-inch obstacle and continue running for at least 15 minutes. 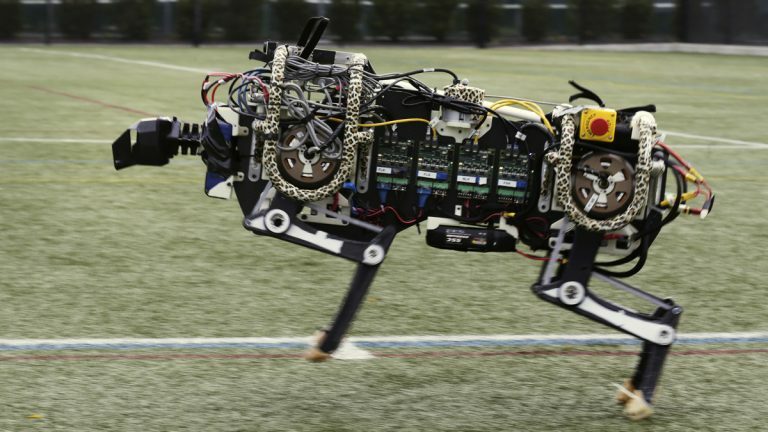 It’s called the cheetah because it runs and jumps unlike any robot built before. They say insight gleaned from the prototype could have real-world applications, including in the design of prosthetics, wearable technologies and vehicles that can travel efficiently in rough terrain. Creating the robot took five years of designing, testing, tweaking and plenty of confidence to ignore those who said electric motors and batteries are not strong enough to propel an untethered mechanical beast. Researchers had to design key elements from scratch, including powerful, lightweight motors. The project is funded by the U.S. military’s research arm.